So smile and a new day is born. 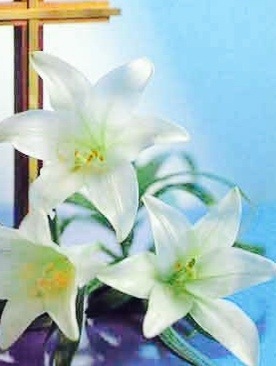 Are the flowers that are yet to be born. For the pain goes and rainbows come without warning. And new life will be born in the dawning. All is green, fresh, springing green, the gardens are reborn. I find that a walk in a garden brings vividly to mind the events of that first Easter morning, perhaps it took time for the shock of the events of the trial, crucifixion and appearance of the risen Jesus in the garden to wear off before his friends finally entered into Easter Joy; after all they had suffered an horrendous, cruel bereavement. The poem, I have been asked to read this one on a couple of occasions, brings the Easter Garden to mind for me, “secrets beneath our feet” … All those beautiful things shared with loved ones gone ahead into the next life before us, sown in trust they hold the promise of joy yet to be as did all the memories, and words of Jesus left in trust in the hearts of his disciples and friends, these secrets became the flowers and fruit of the Gospel which still growing, still springing fresh from the Word today. 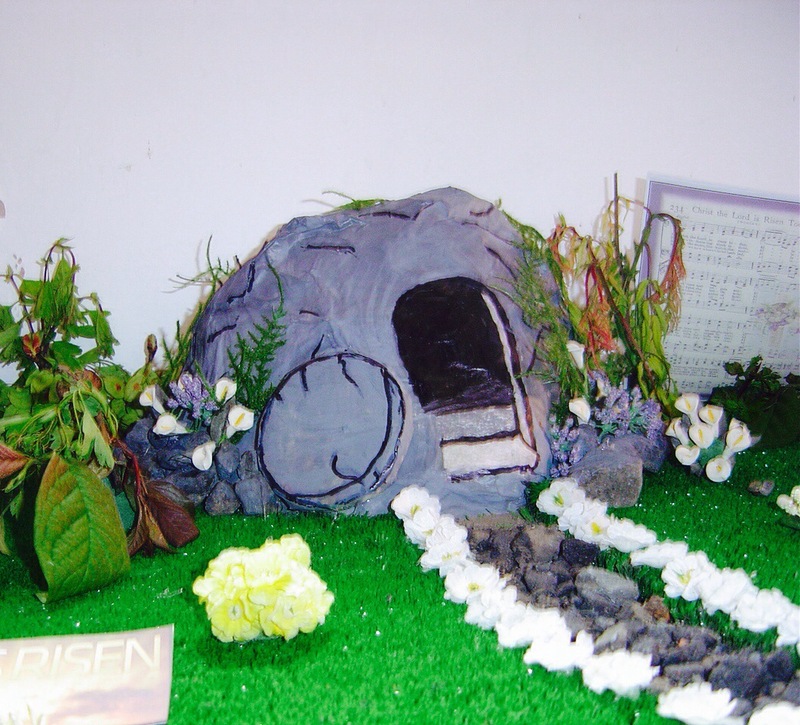 The Easter Garden in the photograph was designed and made by my lovely friend Trish Cornford for the church porch this year I post it with the hope that the Easter Garden and the poem will bring comfort to anyone who is sorrowful at this time. Waits at the threshold, Love’s appointed hour. Well I am more akin to a daisy than a Lily, but this poem speaks to me. First, I count myself with the wheat, “unless a grain of wheat falls to the ground and dies, it remains only a single seed,” Jesus said and The Lord of Glory was that grain of wheat; and in His falling is our triumphant springing up. Then, I am so small, so weak, but God deals with so gently with us, stooping so tenderly matching His power and strength to our frailty. Then The Lord remains unbroken and undivided, completely whole and Holy, so differently other to our squabbling, divided churches. He comes into our lives to flower; not one of us can approach His throne and boast, but He comes to us, about our hearts the True Vine entwines and waits- which of us can be so cold to keep Love waiting? I sigh. I am not tall, graceful as the Lily. But, I am the most expensive of daisies, bought with the Blood of the King of Kings. I am not fit to be a jewel for His crown, but thrilled to have a place with the delicate, bladed wheat, and the daisies that tickle His feet, to be loved by God who comes in little things. So, we are nearly there, Palm Sunday, Good Friday and then Easter Day. I know that not all Christian Fellowships keep Lent or mark Easter in the way mine does but all of us will be remembering that it was for us that Christ suffered, died and rose again, John, the Guest Speaker at the Tuesday Ladies Class wanted to direct our thoughts to the prophetic picture of Christ drawn for us in two particular Psalms. “He trusts in The Lord,’ they say, ‘let him deliver him, since he delights in him” the very words which onlookers shouted scornfully at the foot of the cross. We read the heart aching cry, “But I am worm and not a man, scorned by everyone, despised by the people.” I say heart aching because they are to us the heart cry of the King of Glory. 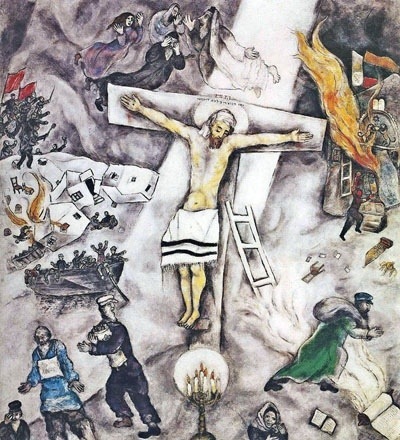 The picture we have been thinking about in church this week is another from Marc Chagall, this one hangs in the 3rd a Floor of the Modern Wing of Chicago Art institute and was painted in 1938. Here is another way of seeing Jesus, a Jewish Jesus, wearing a tallith (prayer shawl) instead of a loin cloth. There are many descriptive symbols in this painting, I leave you to ponder them, the figure in blue wears a placard stating, “Ich bin Jude” – I am a Jew. This is a stark reminder of the cruel persecution of the Jewish people by Nazi Germany and others. What speaks to me is the white light thrown out by the dropped scroll of the Torah in the foreground, see how it travels up the ladder to the cross. To see Jesus in every person is a very difficult thing, because first we need a pure heart, washed clean from all sin, bitterness, hatred, pride, greed these should have no place in hearts that belong to Christ, they are the things which make us blind and prevent us from seeing the Love Who is God. I didn’t take this picture, but I saw the foot whilst on holiday with my sister in Rome, 2004. 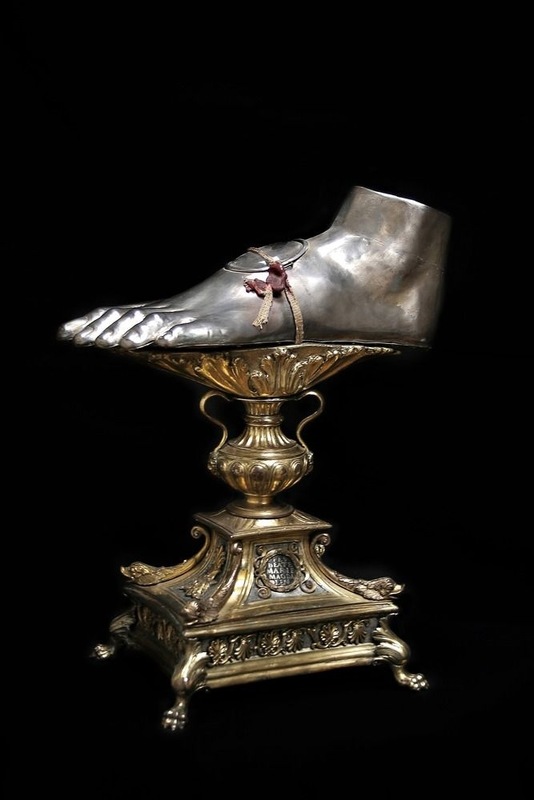 I believe the reliquary is silver/gilt as to whether it actually does contain Mary Magdalene’s foot – I leave that to you. 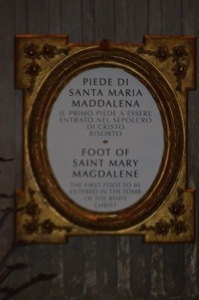 The inscription on the plaque intrigued me, “The First Foot to be entered in the Tomb of the Risen Christ” – we have two feet, who actually was there to record whether it was the right or left foot? My favourite Gospel, St John (ch 20 v1-9) gives the honour of first footer to the apostle Peter, this Gospel doesn’t have an account of Mary going in at all but I rather feel she did. St Matthew 23: 6 says an angel invited the women to come, see the place where The Lord lay, he doesn’t say Mary was first though, St Mark says Mary entered the Tomb but in the company of Mary the mother of James and Salome and St Luke also says the ‘women’ went in, but not which was first. I suppose it is universally true that to be the first is better than to be the second, and definitely better than being the last. But, is it? Didn’t Jesus say something about the first being the last and the last the first? On Maundy Thursday we will recall, once more that at the last meal which the Lord shared with his disciples he took a a towel, poured water into a basin and washed his disciples feet; the First became the Last and attended to the menial task of washing, dusty, hot and bothered feet. With all of what was about to happen to him weighing heavily on his mind, hammering with iron fist on his heart, The Lord Jesus was mindful that those feet needed washing, he sought the comfort of others first put himself last. Perhaps, just perhaps, the foot which truly enters into the Tomb of the Risen Lord is the foot of the person who serves, and who truly understands that in Jesus to be first is rather unimportant, as Paul puts it, ‘And the head cannot say to the feet, “I don’t need you!” It doesn’t matter, right or left foot, right or left hand, we are all essential. The wonderful truth, Mary Magdalene knew for herself – she was important to Jesus simply because he loved her, he loved them all – he loves you, he loves me; there is no silver casket for our feet, there is a place for us in heaven, because His Foot entered in first!